We arrived in Agra early in the morning after another night train, this time a more relaxed ride, although our bunk mates played cards well into the night. After fierce negotiation, with the help of our Canadian friend Josh (we had met in Sikkim), who just happened to be on the same train as us, we zoomed away in autorickshaws, most likely paying twice as much as we should be. After being dropped off at the "West Gate" (we vowed to no longer tell our rickshaw drivers a specific hotel name), we settled in a decent guest house only a few hundred metres from the Taj Mahal. I spent the next two days in bed, this seems to be a common trend after taking overnight transportation. Yann visited the city without me, crossing the river to get the free view of the back of the Taj Mahal. Despite the entrance fee, 38 times that of an Indian Admission ticket, we decided we couldn't be in India without entering the grounds of the Taj Mahal. Although the entrance fee, 750 rupees, is only about 20$, to put it into perspective the most we have paid for a hotel room in India has been 200 rupees and we usually eat dinner for less than 50 rupees each. The owner of a local restaurant nostagically complained to us that since the rise in price, tourists don't stay in Agra very long and are reluctant to spend their money. He complained that most people only stay one night. What he failed to take into consideration was Agra's terrible reputation among tourists. Some years ago tourists died after being poisoned by a local restaurant, the scam involved sending sick people to a clinic that would then charge exhorbitant medical fees. It is, however, sad for the many honest businessmen in the city who have witnessed the possible demise of a lovely tourist destination. Despite having the country's most recognizable attraction, the city seemed empty and gloomy, but Yann and I were surprisingly upbeat (in my case, I think its because Yann bought me a bag of potato chips and a chocolate bar when I was sick). On our third day in Agra, our alarms woke us up at 5a.m. 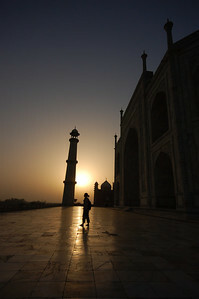 We prepared to fight the crowds for the Taj Mahal sunrise. We walked, in the dark for two minutes before arriving at the ticket office, it was manned by grumpy man who informed us that tickets weren't sold until 6a.m. We waited patiently while grumpy man slipped tickets to the guides in charge of tour groups. Although we were by far the first to arrive at the gates, we lined up at security behind two bus loads of tourists who had arrived right before opening. But justice would be ours! 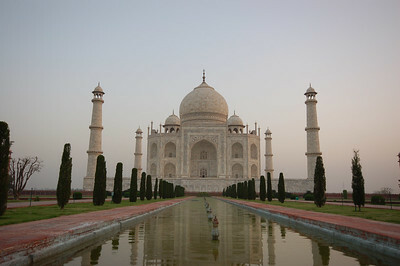 As they were held back by the explanations of the entrance gate and courtyards we raced to the Taj Mahal ahead of them. We stood in awe of the magnificent structure, but more of the fact that there wasn't a single person on the sight. We had the Taj Mahal to ourselves! We snapped away furiously for about 7 seconds before the tour groups crowded in. For the rest of the morning, we managed to mostly stay ahead of the crowds and we visited each part of the Taj Mahal relatively alone with very few people ever crossing in the path of our photos. We even scared the resident monkeys who retreated (angrily and scarily) to the trees upon arrival the first guests. Our experience was calm and even mayble a little bit romantic (Yann will never admit that though) and we didn't regret for a second having forked over 1500 rupees for it. Tres belles photos, très différentes de ceux que vous avez prises a date. Yann, je me suis posée une question, qu'est-ce que tu faisais a quatre pattes, est-ce que tu essayais d'imiter les singes!. Je vous embrasse et faites bien attention a vous, surtout toi Emilie, je crois que les personnes la-bas aiment bien toucher de la peau!!!! 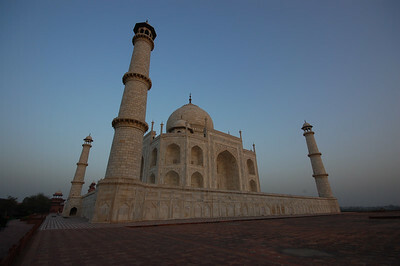 Is it me or does the Taj Mahal look a lot like the Space Shuttle on the launch pad. Hm...?